​Article type: Research article, Received: 18.06.2018, Revised: 24.12.2018, Date of Publication: 25 January 2019. 4 Sri Babu Singh Daddu Ji Agriculture College, Baghar Fatehgarh, Farrukhabad, India. Available sulphur status in soils of Myorpur block, district Shonbhadra, Utter Pradesh, India was studied to evaluate soil fertility. For this purpose, thirty soil samples (0-15 cm depth) were randomly collected from 30 different GPS locations. All the collected soil samples were analyzed for pH, Electrical Conductivity, Organic Carbon, available sulphur as per standard procedures. The available S content in soils of shonbhadra district varied from 11.60-33.30 kgha-1 with a mean value 21.39 kgha-1. Results reveal that the 90 percent of the soil samples were found under low category (< 22.4 kgha-1) as per nutrients index value. Nutrient Index Value (NIV) of Shonbhadra district was below 1.67 due to acidic soil reaction and low content of organic matter in soil and also due to continuous removal of sulphur by the crops for intense cultivation without using sulphur fertilization. For this reason, enrichment and or modification of soil acidity and organic matter content at desired level, as well as frequent application of sulphur fertilizer during crop growing seasons is essential for reducing or changing sulphur deficiency or status for agricultural crops. Soils would highly need sulphur management through addition of inorganic sulphur, organic manures or sulphonated compost and biocomposts or gypsum, sulphur - solubilizing microbes. Singh et al. “Evaluation of soil fertility status for available sulphur in various location of Myorpur block, district Sonbhadra, Uttar Pradesh, India.” Journal of Bioscience and Agriculture Research 19(01) (2019): 1597-1605. Singh, S. P., Verma, J. P., Singh, S. and Kumar, R. (2019). Evaluation of soil fertility status for available sulphur in various location of Myorpur block, district Sonbhadra, Uttar Pradesh, India. Journal of Bioscience and Agriculture Research, 19(01), 1597-1605. Singh, S. P., Verma, J. P., Singh, S. and Kumar, R. “Evaluation of soil fertility status for available sulphur in various location of Myorpur block, district Sonbhadra, Uttar Pradesh, India.” Journal of Bioscience and Agriculture Research 19(01) (2019): 1597-1605. Singh, S. P., Verma, J. P., Singh, S. and Kumar, R. 2019. Evaluation of soil fertility status for available sulphur in various location of Myorpur block, district Sonbhadra, Uttar Pradesh, India. Journal of Bioscience and Agriculture Research, 19(01), pp. 1597-1605. Singh, SP, Verma, JP, Singh, S and Kumar, R. Evaluation of soil fertility status for available sulphur in various location of Myorpur block, district Sonbhadra, Uttar Pradesh, India. Journal of Bioscience and Agriculture Research. 2019 January 19(01): 1597-1605. Brady, N. C. and Weil, R. R. (2002). The nature and properties of soils. 13th edition. Pearson Education, New Jersey. Deshmukh, K. K. (2012). Studies on chemical characteristics and classification of soils from Sangamner area, Ahmadnagar District, Maharastra. Rasayan Journal of Chemistry, 5(1), 74-85. Ghosh, A. B. and Hasan, R. (1976). Available potassium status of Indian soil. Bull. Indian Soc. of Soil Sci. 12, 1-18. Jackson, M. N. (1973). Soil chemical analysis. Prentice Hall of India Pvt. Ltd., New Delhi, (India). Kamaruzzaman, M., Islam, M. N., Siddique, M. N. A., Sarker, B. C., Islam, M. J. and Rasel, S. M. (2014). Liming effect on changes of soil properties of wheat field: a case of Barind area in Bangladesh. Online Journal of Biosciences and Informatics, 1(1), 11-30. Muhr, G. R., Datta, N. P., sankarasubramoney, H., Leley, V. K. and Donahue, R. L. (1965). Soil testing in India. 2nd Ed. USAID Mission to India, New Delhi. Nduwumuremyi, A. (2013). Soil acidification and lime quality: sources of soil acidity, effects on plant nutrients, efficiency of lime and liming requirements. Research & Reviews: Journal of Agriculture and Allied Sciences, 2(4), 26–34. Piper, C. S. (1967). Soil and Plant Analysis. Hans Publisher, Bombay. pp. 85-102. Ramamoorthy, B. and Bajaj, J. C. (1969). Available nitrogen, phosphorus and potassium status of Indian soils. Fert. News, 14, 25-28. Ryant, P. and Hřivna, L. (2004). The effect of sulphur fertilization on yield and technological parameters of wheat grain. Annel Universitatis Mariae Curie – Sklodowska, Sec. E. 59(4), 1669-1678. Sahota, T. S. (2006). Importance of Sulphur in crop production, Ontario Farmer, Dec. 13, 2005, 38(42), Page B25 and Northwest Link, September, 2006. pp. 10-12. Sen, P., Majumdar, K. and Sulewski, G. (2008). Importance of spatial nutrient variability mapping to facilitate SSNM in small land holding systems. Indian J. Fert. 4 (11), 43-50. Siddique, M. N. A., Islam, M. M., Sultana, J., Kamaruzzaman, M. and Halim, M. A., (2014a). Potential of soil sensor EM38 measurements for soil fertility mapping in the Terrace soil of Bangladesh. Journal of Science, Technology and Environment Informatics, 01(01), 01-15. Siddique, M. N. A., Sultana, J., Huda, M. S., Abdullah, M. R. and Chowdury M. A. (2015a). Potato production and management with preference to seed potato supply chain, certification and actors involve in Bangladesh. International Journal of Business, Management and Social Research, 01(01), 01. Singh, S. P., Ram, J. and Singh, N. (2000). 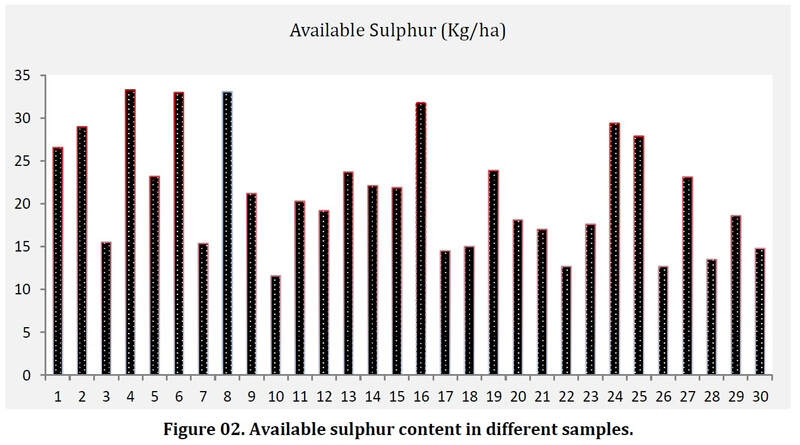 Forms of sulphur in relation to soil characteristics in some soil series of Nagaland. J. Maharashtra Agric. Univ. 25(1), 3-8. Sultana, J., Siddique, M. N. A., Kamaruzzaman, M. and Halim, M. A. (2014). Conventional to Ecological: tea plantation soil management in Panchagarh district of Bangladesh. Journal of Science, Technology and Environment Informatics, 01(01), 27-35. Tondon, H. L. S. (1995). Sulphur fertilization for Indian agriculture-A guidebook (2), fertilizer development and utilization, New Delhi. pp. 101-103. Welch, C. D., Nelson, R. W. and Beaton, J. D. (1987). Opportunities to improve soil testing programme. Soil testing and Plant analysis. Revised Publication. Soil Sci. Soc. Ammer, Inc. Washington, USA. pp. 1-10.